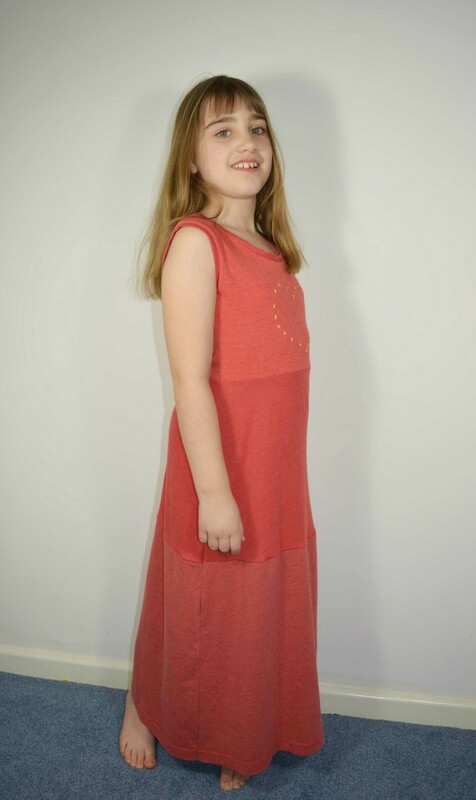 My final make for kids clothes week is a t-shirt sundress. Start by cutting out the bodice part of the dress, either using a pattern or following the layout of an existing dress. Sew together the shoulder seams. Cut out and add two layers of t-shirt fabric, this create the length of the skirt. 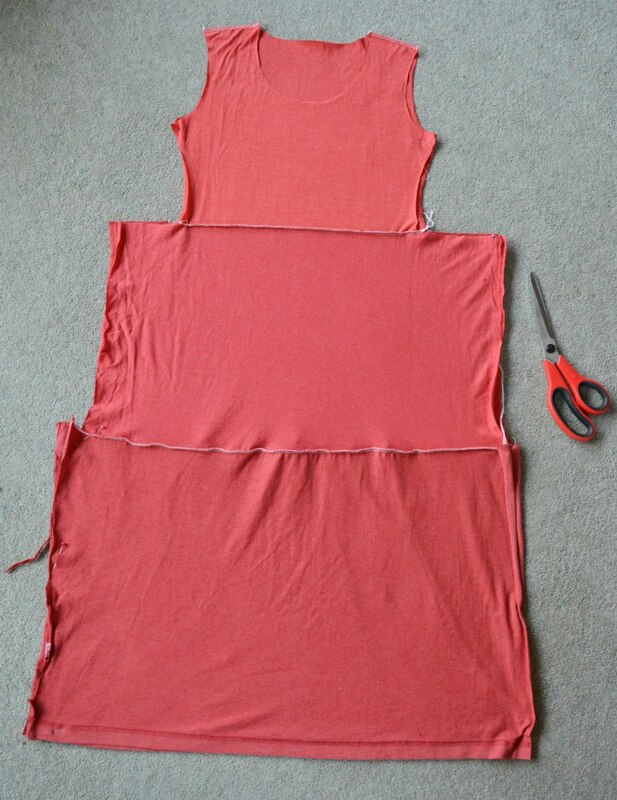 Optimise the bottom of a t shirt for the bottom of the sundress, this saves hemming. Decide on the width of the bottom of the dress, and stitch up to the bodice and on to the arm hole. 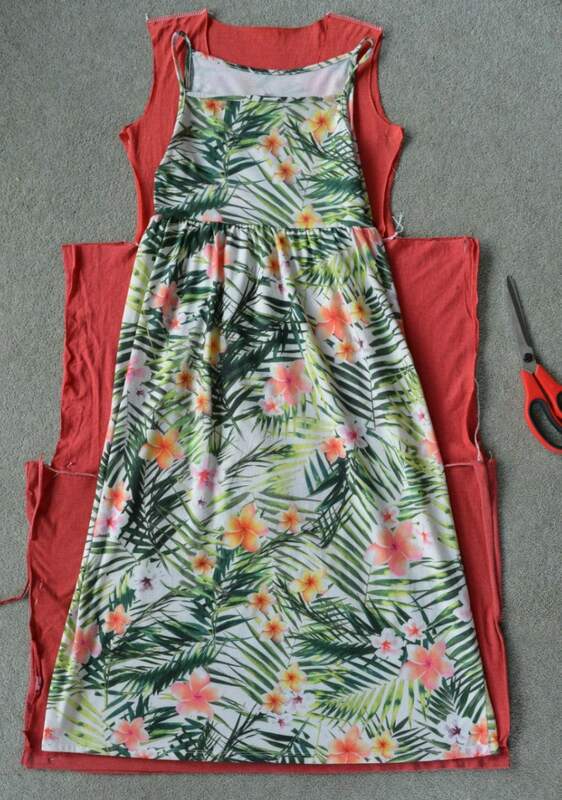 I used a sun dress my daughter already owns as a template for pinning the side seams. Once stitched turn right side out. Decorate or leave plain the bodice. 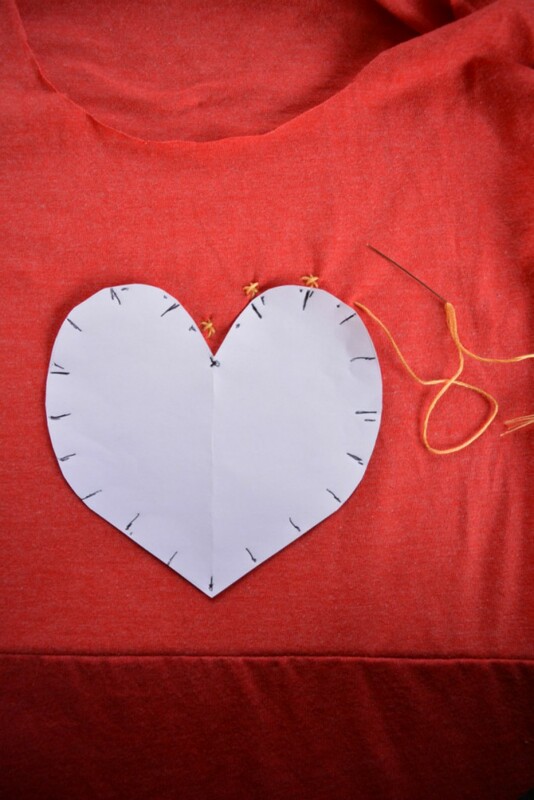 As my daughter loves hearts and decoration I decided to embroider a heart on the bodice piece following a paper template. Finish the neckline and armholes by creating a binding with more of the t-shirt fabric following the tutorial over at Stitched By Crystal. 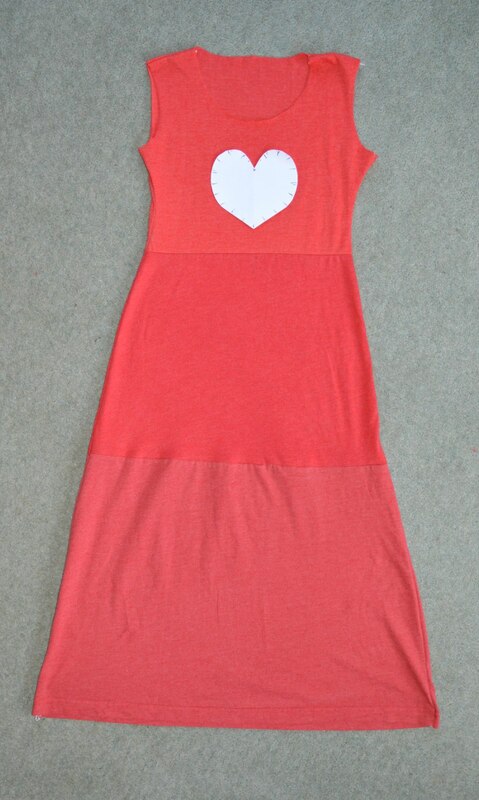 One completed sundress – my husband can’t quite believe he owned three different t shirts of almost identical colour! As you can see my daughter loves this dress, its been worn every day despite the fact its winter here! 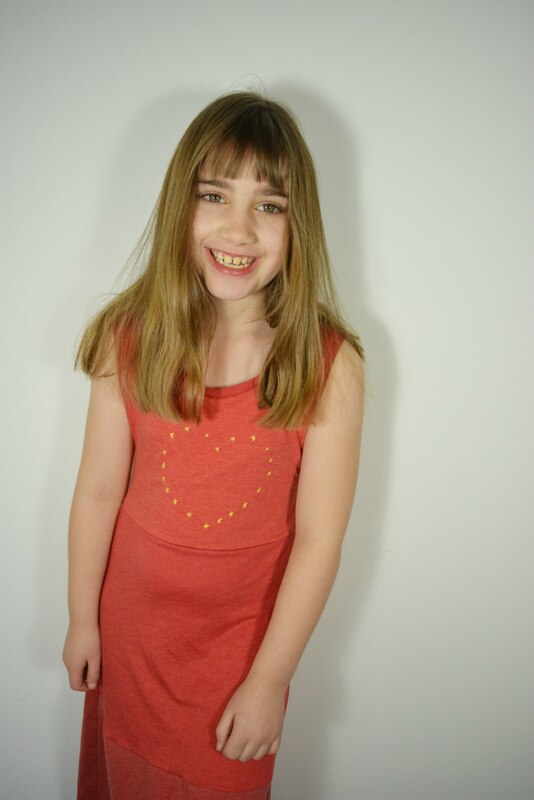 "Raglan T Shirt – Kids Clothes Week – Upcycling"
Another gorgeous and upcycled make, and another great tutorial from you too. Very clever t-shirt adaptation, I can see why your daughter loves wearing it, although I think she’s very brave to be sporting a dress in winter! Ah well… she’s been wearing it combined with a christmas jumper, she has a unique dress sense! What a great tutorial. I love the stitched heart, which is the perfect finishing touch. 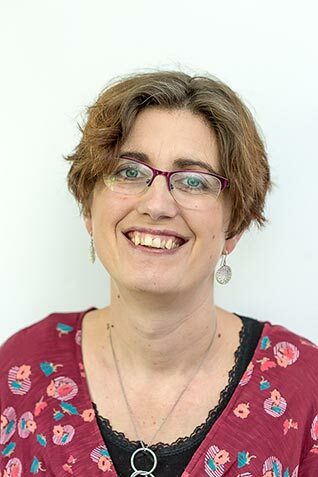 Thanks Ginny – it has made all the difference:) I’m sure she would have loved some sequins but in the spirit of using what I’ve got etc…!! What a brilliant dress and even better that Amy loves it. I really like the fact you added some simple embriodary to it too. I did wonder how you got the dress out of one t-shirt initially. The colours are so similar. What a great looking dress and I love the fact that it’s been upcycled, not suprised Amy loves it. Great upcycling again Vicky – it looks comfy and pretty – I’d wear it despite this weather too! The binding really finishes it off nicely. I love upcycling things. You did a great job. It is funny how many of us usually don’t realize how many t-shirts we have of the same color/shade. I dread to think how many white ones I have:)! Your up cycled t shirt makes are great although not sure your husband will agree come summer when he goes to find a t- shirt? I reckon he’s still got twenty plus!!! What a wonderful upcycle and gorgeous model! Cheers, I did put some effort into getting a giggle or too and therefore a more relaxed look! heart. I bet you daughter can’t wait for some warmer weather so she can wear it. Adding the heart embroidery finishes the dress of beautifully, Vicky. A great refashion!!! Thanks Pam – couldn’t bring myself to buy sequins which I’m sure she would have loved!! Aw she looks so happy! Great idea and great job, what a good way to make use of old tees. This looks so comfy! Great job!